A place not to missed. 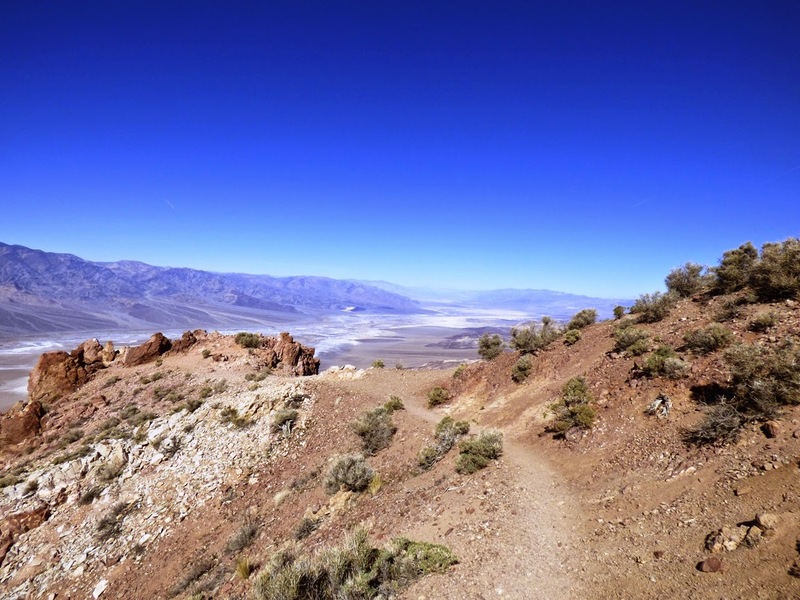 That's what I have to say about Dante's View in Death Valley National Park. And if you ever get there, don't just stand in the parking lot. Short walks in several directions offer even better views of the incredible landscape surrounding the lowest place in North America. Death Valley may get hellishly hot sometimes, but it's not a view of hell but is instead a dramatic perspective of some of the most interesting geology in the American West. 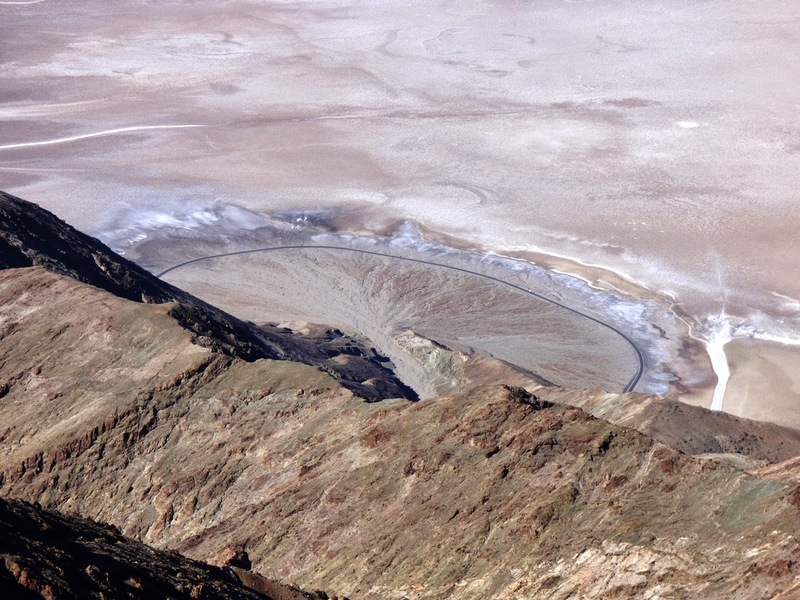 The Black Mountains form the eastern margin of the deepest part of Death Valley, almost directly across from Telescope Peak, at 11,043 feet (3,366 meters) the highest point in the park. 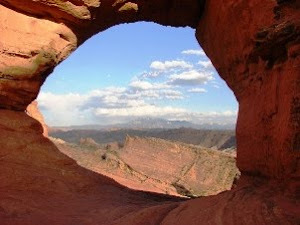 The viewpoint is a bit over a mile in elevation at 5,476 feet (1,669 meters). 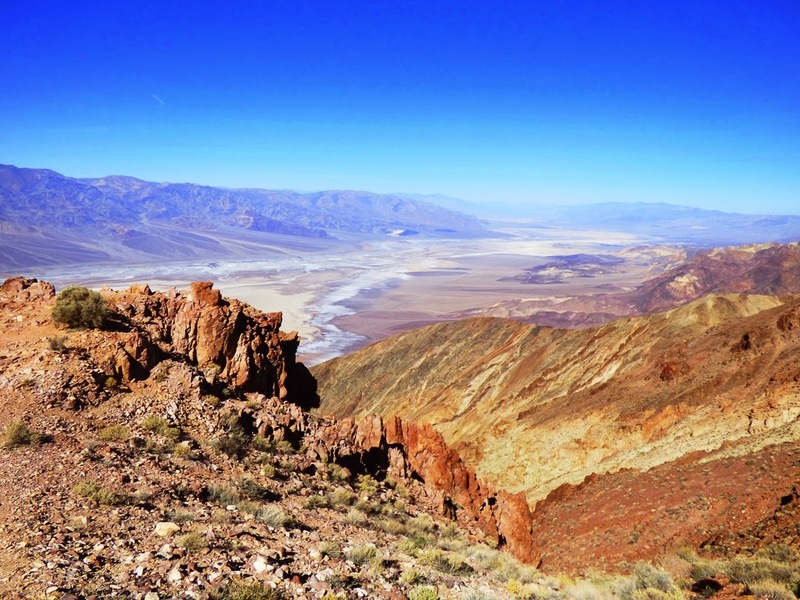 From the viewpoint one can take in almost the full length of Death Valley, a distance of more than 100 miles. 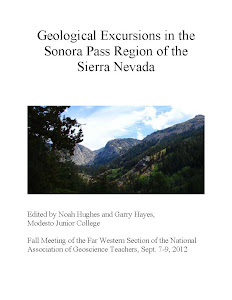 Once also look east across the numerous mountain ridges of the Basin and Range geological province to Charleston Peak above Las Vegas, Nevada. 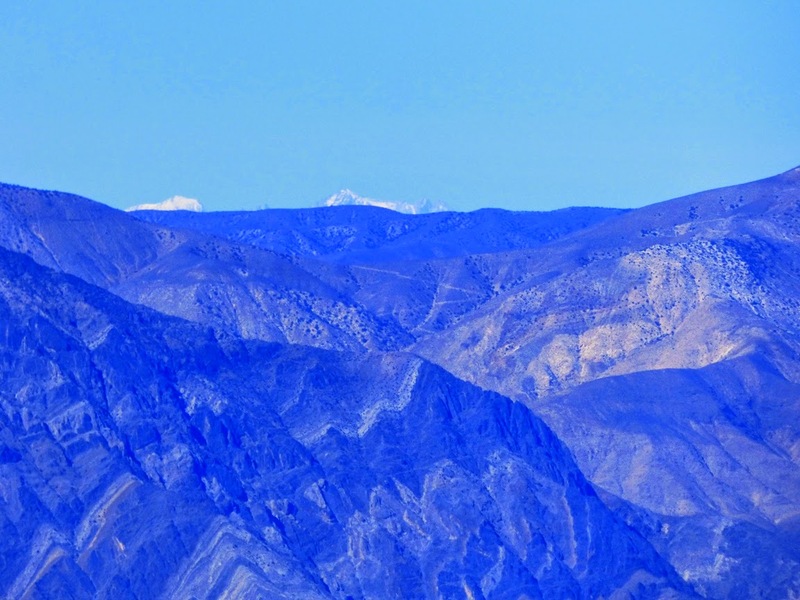 A few summits of the Sierra Nevada peek out over the ridge of the Panamint Range across the valley. 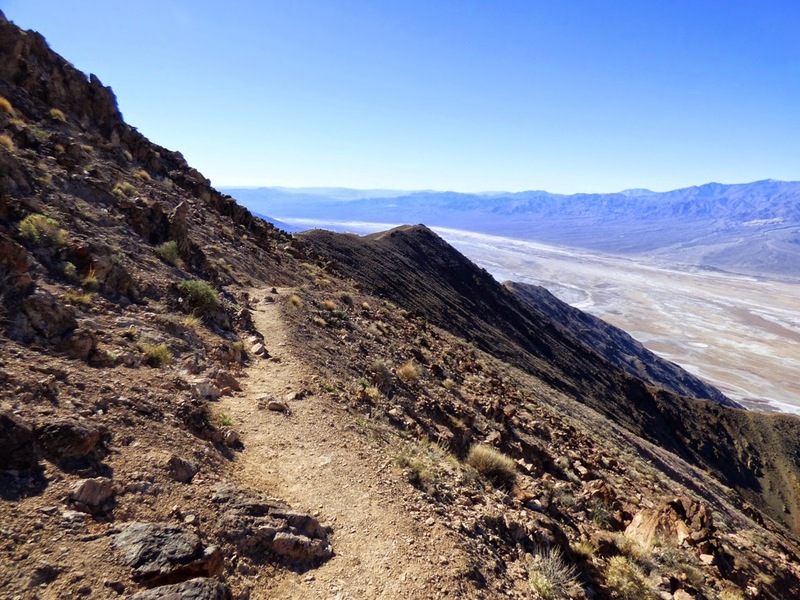 Directly below one's feet is a steep one mile drop to Badwater on the valley floor. 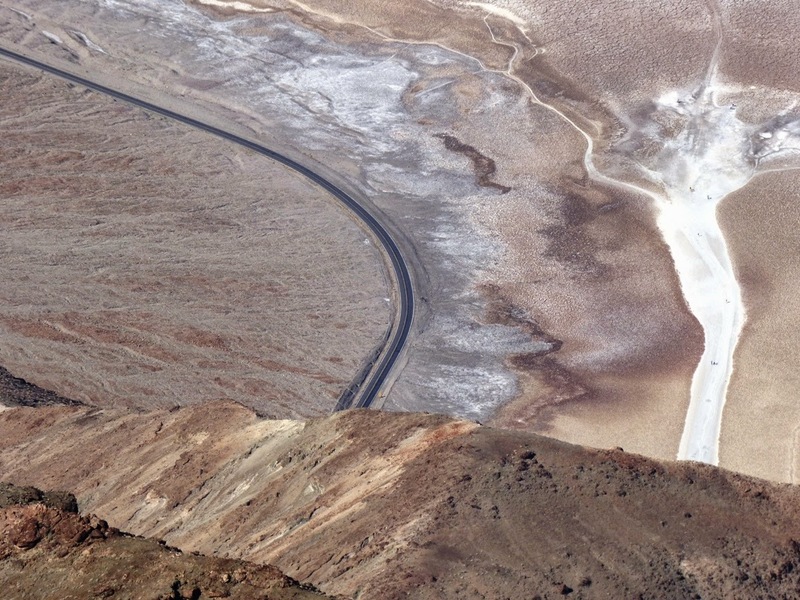 The slope is so steep that the parking lot and Badwater pond are not visible, but very small humans can be seen on the white trail leading out to the salt flats, and very small cars can be seen driving on the highway that circles the edge of the alluvial fan. The Black Mountains are composed mostly of the oldest rocks in the region, a complex of gneiss and schist dating back 1.7 billion years. Similar rocks are found in the depths of the Grand Canyon in Arizona. 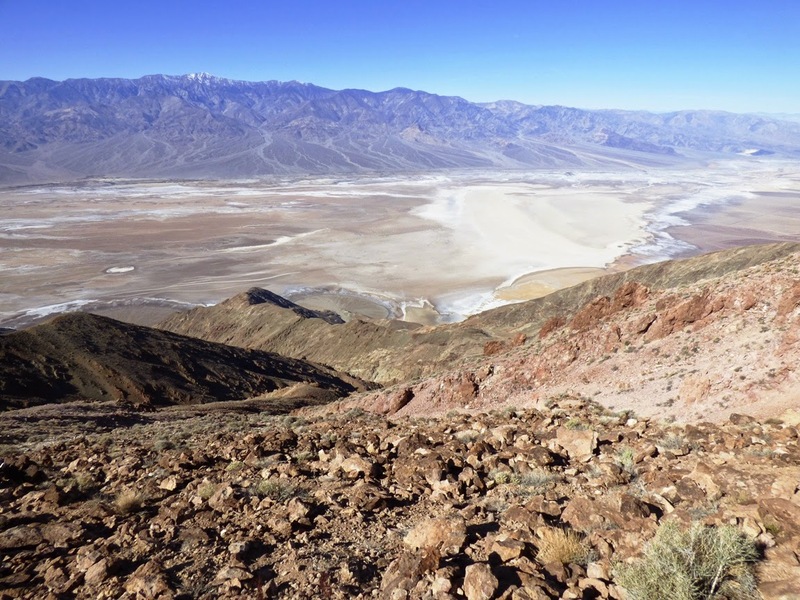 They were once covered by several vertical miles of Paleozoic sedimentary rocks, but those rocks have slid westward to form the Panamint Mountains. The gap between became the graben of Death Valley itself. The rocks making up the summit area are volcanic rocks, mostly rhyolite, which were erupted in violent eruptions around 6-7 million years ago. Such rocks have been found across the Basin and Range province, indicating extensional stretching and failure of the crust, which ultimately formed the grabens and horsts of the region. I take my use of superlatives in describing viewpoints seriously. You can see my ten (eleven, actually) most precious "spots" in the world, and Dante's View is on that list. There may be other places in the world that allow one to see far, but I suspect few reveal a more stunning and fascinating landscape. There is a myth sometimes repeated that one can see Mt. Whitney from Badwater, which is simply impossible because the Panamint Mountains rise 7,000-8,000 above the adjacent valley floor. One can see the tips of several Sierra Nevada peaks from the hill north of the parking lot at Dante's View, but I think the highest peak visible is Mt. Williamson at 14,389 feet (4,383 meters). 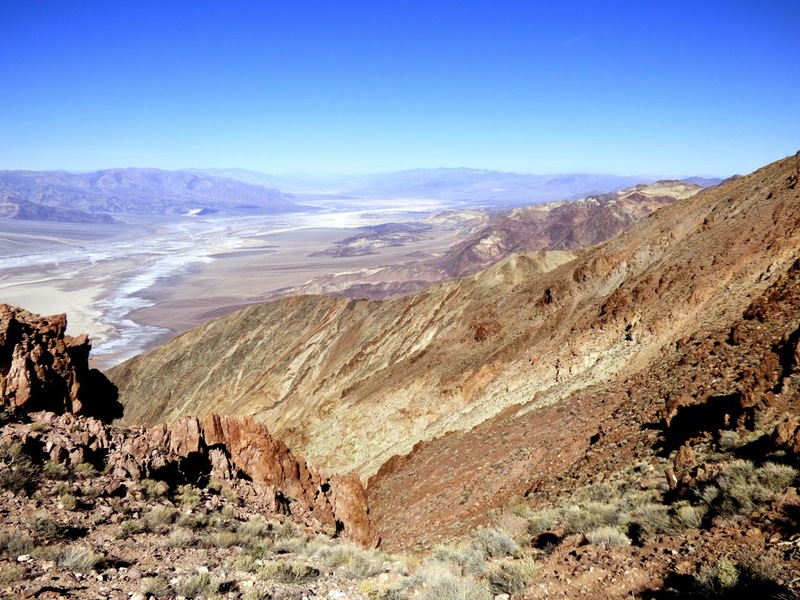 It is possible to simultaneously see both the highest and lowest points of the conterminous United States, but you have to find your way to the summit ridge of the Panamint Mountains and Telescope Peak to do so. It's truly a place and a view not to be missed.